For five years, James and Deborah Fallows have travelled across America in a single-engine prop airplane. Visiting dozens of towns, the America they saw is acutely conscious of its problems—from economic dislocation to the opioid scourge—but it is also crafting solutions, with a practical-minded determination at dramatic odds with the bitter paralysis of national politics. At times of dysfunction on a national level, reform possibilities have often arisen from the local level. The Fallowses describe America in the middle of one of these creative waves. Their view of the country is as complex and contradictory as America itself, but it also reflects the energy, the generosity and compassion, the dreams, and the determination of many who are in the midst of making things better. 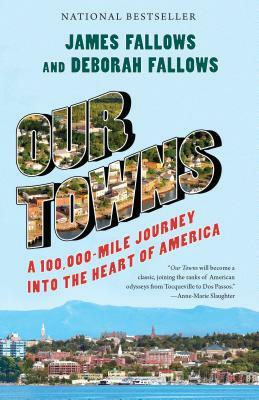 Our Towns is the story of their journey—and an account of a country busy remaking itself. DEBORAH FALLOWS is a linguist and writer who holds a PhD in theoretical linguistics and is the author of two previous books. She has written for The Atlantic, National Geographic, Slate, The New York Times, and The Washington Monthly, and has worked at the Pew Research Center, Oxygen Media, and Georgetown University. She and her husband have two sons and five grandchildren. “In the tradition of John Steinbeck and Studs Terkel, the Fallows have crisscrossed the country in search of the extraordinary strength and character of ordinary people and places. What they’ve found—in towns we know and others off the beaten path—should give us all great hope for the future.” —California Governor Edmund G. Brown Jr.